Arista’s 7170 programmable network switch with Barefoot Tofino silicon enables customers to deploy one system in multiple ways. Options. Everyone needs options. Whenever I travel somewhere with my wife, Christine, even if it’s for a weekend, she needs to check a bag. When I ask her why, she says, “A girl needs options,” hence the oversize luggage. While it’s been easy for someone like my wife to have options, network engineers have never really had the same luxury. 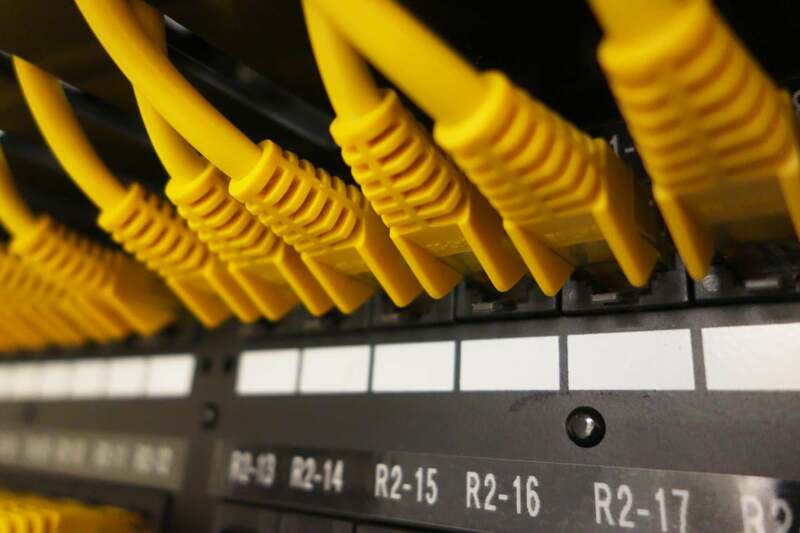 Network switches were typically built with fixed functionality, so an organization would need to purchase a wide range of equipment to meet all their needs. Recently, the chip manufacturers have been building more programmable, flexible products. One of the examples of this is the Cavium XPliant processor that is the silicon that powers Arista’s 7160 switch. Another example is the Barefoot Networks Tofino processor. In addition to being one of the most scenic places on the planet, Tofino is a powerful system on a chip with a fully programmable parser and pipeline. The chip supports 256x 25 Gig-E Serializer/Deserializer (SerDes) at speeds of 1, 10, 25, 40, 50, and 100 Gig-E. This week, Arista announced an addition to its 7100 series: the 7170, which leverages the Tofino silicon. The 71XX line has become Arista’s value-added set of switches and includes the 7150 (Fulcrum) and previously mentioned 7160 (Cavium). 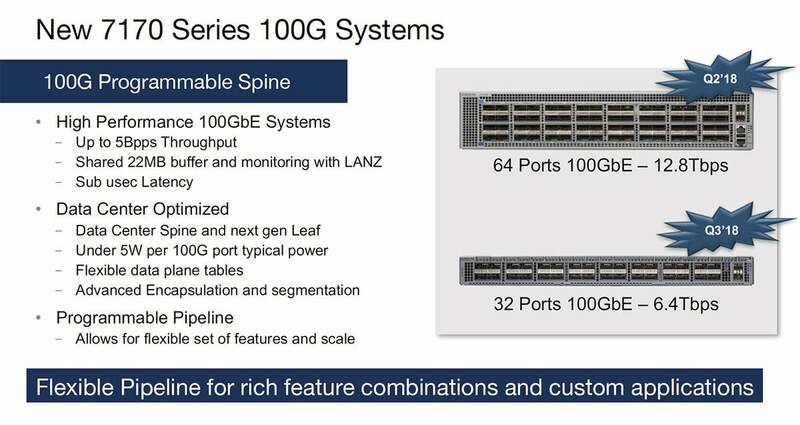 I believe Arista is the first networking vendor to announce a product with the Tofino processor. There may be some white box provider that has a Tofino-based product, but Arista is the first one with volume. The big problem the Arista 7170 solves is that through programming, it can put many features that operate in additional network tiers back into the network. For example, smart NICs are used to offload tasks such as network address translation (NAT) and tunnel termination from the network to the server. The reason for offload is performance, as building all these features into the network can be a drag on the network infrastructure. However, as is the case with everything in life, nothing is free, and as more functionality has moved to the NIC, it has caused a drain on the server. The problem hasn’t really been solved, just moved. The programmability of the 7170 enables specific functions to be moved back into the network and because only those features have been programmed in, there is little to no performance hit on the network and it allows the compute pool to do more computing with fewer resources, saving money on hardware, power, cooling, and all the other costs associated with running a server pool. One of the difficulties of using a programmable switch is that the programming isn’t easy, and messing around with the network pipeline could have some disastrous consequences. This is one reason why many customers, even technically advanced ones, have stayed away from the Cavium-based white boxes. One thing Arista has over a white box is the company is releasing the product with pre-built templates, allowing customers to quickly configure the switch for their specific needs. One product — multiple deployment models leads to more options. By providing the templates, Arista de-risks the deployment of something that customers may have shied away from because of the programming challenges. Applying the profiles is simple, as well. When the switch is powered up, the engineer will be given a choice of profiles and they can pick the one they want. Network professionals can also configure their own profiles. It’s also worth noting that the switch is re-programmable, so a new profile can be applied when the organization requires it, adding to the flexibility. At launch, Arista will have two templates available. One for a feature-rich layer 2 and 3 switch, and the other for bare-metal configuration for cloud. The company plans to release a number of other templates in the near future, with security and telemetry profiles coming in August 2018. Two configurations of the 7170 will be available. The 7170-64C is a 2RU switch that supports up to 64 ports of 100 Gig-E or 12.8 Tbps with up to 5Bpps of packet forwarding. And the 7170-32C is 1 RU form factor with 32 ports of 100 Gig-E with the same range of performance. Pricing starts at $1,200 per 100 Gig-E port for the 64-port system. Arista has always touted flexibility as part of its value proposition. Customers that use Arista can deploy a wide variety of switches running Broadcom, Fulcrum, Cavium, and now Barefoot silicon. The operating system, EOS, will be the same on each switch, with some value-added extensions that are unique to the chips. This is preferable to the more common model where a vendor would need to build an entirely new operating system to support the new silicon. A programmable switch has been network nirvana for the better part of a decade, but it has been hard to realize because of the complexity of programming. Arista has taken the most programmable silicon and through the use of profiles, lets its customers deploy the same hardware in multiple ways. These are options even my wife would like!